Thomas Mahmoud - Univorm. Bleep. 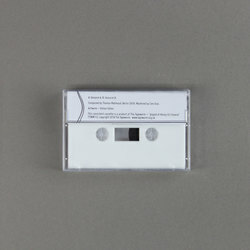 The prolific Thomas Mahmoud rocks up on The Tapeworm (Stephen O’Malley, Pye Corner Audio) for a full-length cassette. Univorm finds the former Von Spar singer and Mouse On Mars collaborator constructing a record from ‘mistakes’ and ‘incorrect sounds’. For instance - when a bass string is hit and creates a load of hisses and overtones, Mahmoud amplifies them until they are fully incorporated into Univorm’s sonic mesh. It makes for another intense listening experience that has been brought to us by The Tapeworm.